For those of you who pay attention to the schedule posted on Sundays, there’s been a slight change. I have traded places with Krista Phillips. She’ll be posting in my slot next Tuesday. In the meantime, I’m going to talk about my writing journey. Here’s my writing space in one of its cleaner moments. 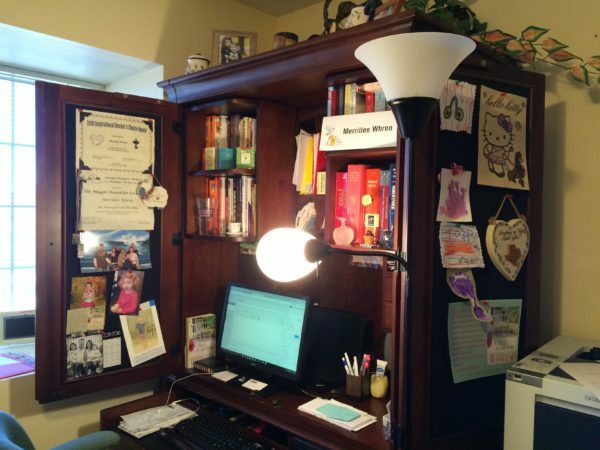 I’ve posted this photo before when I talked about the writing spaces I’ve had over the years. I started writing when I was in high school and shared my story with my friends. Many years would pass before I started writing again when my children were in elementary school. I wrote for twenty years before Love Inspired, then known as Steeple Hill, bought the eighth book that I had written, not counting the one from high school. My children were grown and on their own by then. I believe God knew that I needed to be an empty nester before I could handle the life of a published author with its deadline demands. Subsequently, I was able to sell two of those earlier rejected books to Love Inspired after they had been revised, and I have self-published two. The seventh book I wrote, A PLACE TO CALL HOME, is one of those self-published books. It is on sale now for 99 cents. Buy buttons for various vendors are located on my website. A PLACE TO CALL HOME is dear to my heart because it’s the book that made for one of the lowest points in my writing career and one of the highest. The idea for this story came from an icicle that hung from the eaves on our house in Massachusetts one winter. It was gigantic and had a very sharp point. In my crazy writer’s mind I wondered whether a person could use something like that as a murder weapon. It would melt and there would no longer be a weapon. I never did use that element in the story, but the idea for a story set in Massachusetts that involved a murder percolated in my mind for the next seven years. Finally I decided to write the story that became A PLACE TO CALL HOME. I entered the story in numerous contests for unpublished authors and received a request for the full from one editor who judged it. In the meantime I entered the book for a second time in the Romance Writers of American Golden Heart Contest. The editor had had the manuscript for nine months without a word. Finally, I sent an inquiry about it. I should have done that months earlier, but I was going by the adage, “No news is good news.” Two weeks after entering the Golden Heart, I received a rejection on that book. That was a low point for sure. I thought I had wasted my money on the Golden Heart entry, and a book that I thought was a winner was rejected. At that point I told my husband that I was finished with writing. I said, “If they can’t buy that book, I don’t know that I can write anything that they will buy.” This was a week or so before Thanksgiving. I enjoyed the holidays with family and friends and didn’t think about writing. But when the new year started, I had this story idea that wouldn’t let me go. I started writing it. My husband reminded me that I had quit writing, and I told him that I had to get these characters out of my head. Then I’d quit. I worked on that story without any urgency, but in the back of my mind I wanted to know whether God wanted me to write or whether I was just going my own way and wasting time that could be better used. An unspoken prayer lingered in my thoughts. If I was supposed to continue writing, I would win the Golden Heart. Now this was a long shot because I had entered the same manuscript in the Golden Heart the year before and got middling scores. I hadn’t changed it at all because that was the version of the manuscript the editor had. I didn’t voice the prayer because if I didn’t win, it meant I wasn’t supposed to write. And I wasn’t sure I really could quit. The day the calls went out for the Golden Heart I wasn’t home, and I didn’t use a cell phone. I got a call the following day telling me I was a finalist. I immediately made plans to go to the RWA conference in NYC. Over the next couple of months I scrambled to finish the story I was working on so I’d have something to pitch at the conference, since my Golden Heart book had already been rejected. I finished the manuscript the day before I left for NYC. I interacted with the other Golden Heart finalists on the GH loop. One of the finalists in my category had a request from one of the judges so it seemed as though she would be the winner, and she had won the Golden Heart with a different manuscript the year before. To my surprise and complete delight, I won. I could hardly believe it when the title of my book went up on the big screen. I never really did hear my named called. 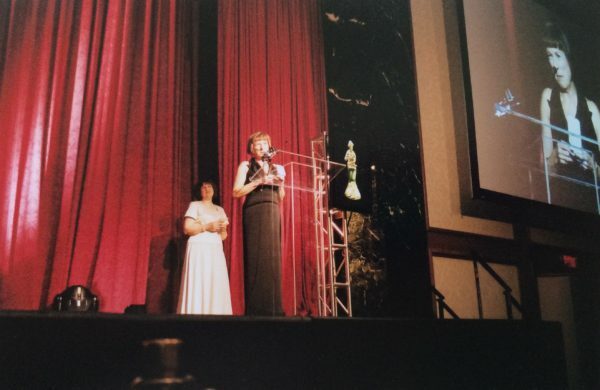 Here I am accepting my Golden Heart Award at the conference awards ceremony. That was definitely a highlight in my writing career, and an answer to an unspoken prayer. Although I never sold A PLACE TO CALL HOME to a publisher, I believe winning that award was a help in my journey to publication. I’m thankful for my publishing experience with Love Inspired, and I’m grateful for the opportunity to publish books on my own that a publisher doesn’t want for various reasons. What experiences have you had with prayer and guidance for your life? I’ll be giving away the three books in my Village of Hope series to one person who leaves a comment on the blog. I will draw the winner’s name on June 25, 2017 at 9PM MST. Thanks for sharing your writing journey with us, Merrillee. What a journey you’ve had! Yes, Wemble. God’s plans are so much better than ours. Thanks for sharing your story. A place to call home is up in my TBR list. I plan to get to it soon. Priscila, you’re welcome. Don’t miss the sale on A Place to Call Home. It’s 99 cents through the end of June. I love your desk! We’re currently seeking God’s guidance for a new church home. God led us to sell our home of 30 years and move close to our children who had all relocated to a much cheaper area. It’s been a journey! We’re living with our oldest and her family while waiting for our house to be built. Our kids have all been very gracious in helping during our transition. Diana, best wishes on your move. We moved closer to our granddaughters a few years ago, and it’s been a real blessing. 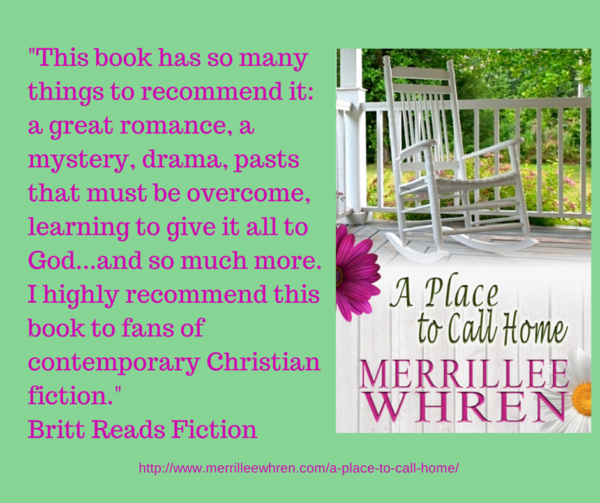 I read A Place to Call Home recently and loved watching the layers of the story unfold! Thanks, Valerie. I’m glad you enjoyed it. Thank you Merrillee for letting us know what life was like before. The hardship and moments when faith seemed gone. This is a great story of no giving up although you wanted to. I believe when God has a plan for us he knows when the right time is for us to achieve it. You couldn’t get the stories out of your head which was a sign. I am glad you didn’t give up. Thanks, Colleen. We writers always have stories and characters to keep our minds occupied. Man plans his way but the Lord orders his steps. One of my favorite Proverbs. It’s funny sometimes how we plan but God’s plans are always best. Gail, that is so true. Thanks for the reminder about that verse. Love your books, Merrillee! So glad you persevered and never gave up! Love your books and your writing journey. Thanks for sharing your writing journey! Love your books and hope to read ALL of them! You’re welcome, Jackie, and thanks. No need to enter me as I’ve read all three of these wonderful books for you! Thanks, Trixi. God is indeed faithful. Thanks for sharing your story! I’m really glad you didn’t give up writing! Thanks for sharing. What a neat story. I understand about having an unspoken prayer and not wanting to voice it because you’re not sure if you want the answer. So true, Jessica, but God knows what’s in our hearts.